Let me give you a little UNDERSTANDING of war and PEACE. Why can't the heads of government in the nations of the world realize that ONLY GOD has the ANSWERS? That the BIBLE is the most up-to-the-minute source of knowledge and UNDERSTANDING in today's world for the solution of all problems? 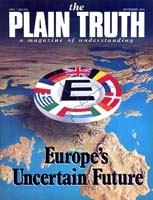 The Plain Truth is a world NEWS magazine, keeping you abreast of the KEY world happenings leading us directly into the PEACEFUL and HAPPY WORLD TOMORROW — but, too, it is MUCH MORE! It is a magazine of UNDERSTANDING — understanding not only of key happenings in world news, but UNDERSTANDING of life itself, of the PURPOSE and real meaning of life — of the CAUSES of problems and troubles, whether personal and individual, national or world problems — and of their SOLUTIONS, and of HOW, and WHEN, and by WHAT MEANS all these giant problems are going to be solved! More, and most important of all, The Plain Truth brings you UNDERSTANDING of the very Word of God, the SOURCE of TRUTH — and of the PROPHECIES of events soon to occur, in the next two, five or 10 years! WHY do nations go to WAR? WHY does God allow wars, violence, human suffering? Many reason if God is LOVE, he surely would not want all this suffering! And if he is all-POWERFUL he could prevent it. So WHY doesn't he? Certainly God could stop it — and in fact, soon will! But why not millennia ago? For a supremely important reason! A PURPOSE is being worked out here below. Man was put here on earth for the development of right CHARACTER. That PURPOSE requires free moral agency in man. It is necessary that man be given both the prerogative and the ability to make his own decision! Otherwise he would be an automaton — no character. There is A WAY that will produce peace — a way to happiness, abundant well-being — and with it, God will give eternal life! What is that way? The Eternal Creator set in motion not only the laws of physics and chemistry — laws like gravity and inertia — but also a spiritual law that is THE WAY to all these wanted blessings. It's a simple matter of CAUSE and EFFECT! That law is the way of LOVE. And love is outgoing concern. It is giving, helping, serving, sharing — but human nature pulls humanity in the exact opposite direction — into being SELF-centered, selfish, greedy, the way of vanity — the way of getting, taking, accumulating — of competition, strife, envy, jealousy, resentment, hatred. God's great spiritual LAW is simply, the CAUSE of peace, happiness, abundant well-being. The violation of that law, by yielding to the pulls of human nature is simply, the ABSENCE of peace, happiness and abundant well-being. God laid before man the knowledge of his law — his WAY! He compels man to CHOOSE! Would man want God to FORCE him to go God's way, contrary to the desires of human nature? Never! He would cry out, "God is unfair!" Man wants the right of free choice. So to fulfill his PURPOSE, the Creator marked out a duration of 7,000 years. The first six of those millennial "days" were set aside for man to CHOOSE whether to OBEY God's law — that is, voluntarily come under GOD'S GOVERNMENT — or work out his own ideas of HUMAN government. Man chose to reject God, his government and his law. He elected to follow the desires of his carnal self-centered nature. Obedience to God's law of peace is the CAUSE of peace.